I remember this game being fairly tricky. There were quite a few platform adventure games during the Spectrum's life, Dizzy being one of the most famous (at the time). The idea of a non-combat adventure where you solve puzzles without resorting to violence struck a chord with me, and still does to this day. With Dizzy you ran around solving puzzles with inventory items while avoiding enemies with running and jumping - a task made more difficult by Dizzy's tendency to roll around. Slightly magic was a little different in this regard. Instead of controlling a rolling egg, you controlled a young wizard - complete with wizard's robes and hat; and instead of purely needing the right object at the right time, in Slightly Magic you have use an item with a spell to make the spell work as well as have your spellbook and magic wand. The spells can be used many times and do various things from make ghosts fly away to change your shape; There's even a spell to give a giant an itchy head. Spells use magical energy which you obtain from stars you collect. It was a nice and refreshing addition to the regular inventory mechanic which opened up new elements of gameplay. The main character of the game is a young magician named Slightly. Slightly's Uncle, the wizard Bigwiz has left the castle in a hurry and has forgotten a whole load of things in his haste, one of these things being to take his nephew with him. He also forgot to lock the door to the laboratory and the spell cabinet has been knocked over sending the spells everywhere. All this coupled with the fact that a sunburned dragon has made off with Princess Croak, it's up to Slightly to fix everything. I typically review old games which struck a chord with me in some way while I was growing up. They are normally obscure titles which deserve looking into and will often need the reader to dig around for them. They are the ancient games I grew up with and are not generally available for purchase. This review will be a little different in that Colin Jones has re-released Slightly Magic on tablets and the OUYA. This review will focus on the OUYA version - mostly to support Colin Jones and the OUYA and in some small way because it's very difficult to get hold of CodeMasters games on-line to play due to CodeMaster's legal block on them. Thankfully Colin has been able to re-release the game so that future generations can play it and to prevent it from being lost to obscurity. I sincerely hope other CodeMasters games share similar good fortune otherwise they will fade from memory altogether. This good fortune does present a problem for me though. Given that the game has been re-released, I am torn whether to review the game from a modern perspective or against its peers of the time - after all, I gave Treasure Island Dizzy a glowing review in spite of the fact that it would probably be responsible for the destruction of TVs through controller impalement. However given that Slightly Magic is available for purchase and it's peers are contemporary, perhaps a purely nostalgia based review might not be right. I will however review it as fairly as possible. 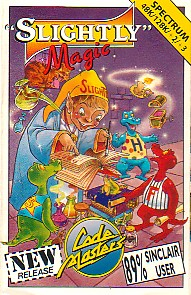 You start the game looking at the young wizard, on the screen you can see a spell book and a magic wand (also belonging to Bigwiz the wizard and also forgotten). The magic wand is in a corner of the screen blocked off with walls. To get the wand you're going to have to work out the way to that part of the castle.. but first of all, you have to get past some dragons. The dragons burn you if you get too close, not deliberately mind you, they are thirsty and are breathing fire so they need some water to put out the flames. The problem is that they'll only drink from their own buckets. They're the King's dragons so they're picky like that. This leads me to the first issue I have with the game. It's difficult to know what will kill you and what won't without experimentation and that can be dangerous - also with your lives being limited, you'll be replaying some bits of the game over and over. Not as fury inducing as Treasure Island Dizzy though. Once you've worked out the solutions to puzzles, you'll optimize your path in no time. This type of gameplay was commonplace back in the 80's and 90's but not really seen any more. Whether it causes more frustration now than it did back when I was a kid I'm not sure. What I am sure about though is that modern games have removed these gameplay elements for better or for worse and no-one is complaining. The game appears to rely on the player making mistakes to learn where some off screen platforms will be. Some platforms require the player to jump from one platform on one screen to land on a platform on the next as there is a gap immediately which would cause the player to fall should they just walk off-screen. However, all of these points are due to the fact that this game is a remake of a 20 year old game so we're going to cut it a reasonable amount of slack. It would have been tempting I'm sure to alter the game in small ways but this could have lead to the loss of the soul of the original - something which thankfully the game has kept. There is no save system in the game to record your progress. Once you run out of lives you'll have to restart the game. This is perhaps fair, however should you find yourself running out of time to play, you cannot save the game and come back to it. This is a real throwback to the original time when saving was more trouble than it was worth however I'm not sure that modern gamers will be able to overlook this. I feel that this would have been something that could have been implemented behind the scenes, saving progress as the player went along and allowing the player to reload the game state or choose a new game. Oddly enough in it's defence, the game is quite short and can be completed in about 20 minutes if you know what you're doing. The graphics are charming and cute, taken pretty much directly from the ZX Spectrum version. This is as close as you're ever going to get to the original Pixel-Art style. Every pixel on the spectrum had to be crafted with care. It all still works. The graphics are crisp and clear with nice chunky pixels. The remake also doesn't need to worry about the Spectrum's limited number of colours per block of 8 pixels so there's no annoying colour clashing going on. Whether new potential fans will appreciate the style or be put off by it remains to be seen. I'm pretty sure the discussion was had to upgrade the graphics or not when this project was first floated. Personally, I like the graphics. As a child from the Spectrum years, they are familiar and look different enough to stand apart from the competition. Pretty much everything in the game is animated to some extent. From a bouncing glittering spellbook to spooky ghosts. Even the user interface has a bubbling bottle of some magical liquid showing your lives and there's a really cute bouncing star showing the number of stars you have collected. A jolly tune played throughout Slightly Magic on the 128k Spectrum version and of course on the Amiga version. It matched the tone of the game well feeling like it belonged as the title for a 90's Saturday morning cartoon. The remake doesn't stick with the spectrum version of the soundtrack. It appears to be taken from the Commodore Amiga version - which as a fan of the original was a little jarring especially with the Spectrum graphics. The tune is basically the same but there are differences. All those hours from my childhood had burned the theme-tune into my brain (and I do have a great memory for music - if little else) and I do find the 128 Spectrum's sound particularly pleasing. The newer sound-track is certainly richer and changes song as you visit different areas which is a nice touch. From the jolly tune in the castle to a spookier version to go with the forest outside. What's nice is that it keeps the main melody. Here are the two soundtracks to play and compare - however they are both walk-through videos so be aware that they will contain solutions to puzzles and spoilers. Viewer discretion is advised. Since buying the game for the OUYA I learned that Slightly Magic was the subject of a kickstarter campaign to bring the game back to life for tablets and the OUYA - unfortunately it did not meet its funding goal which is a real shame. One of the features should it have been successful was to have Allister Brimble re-record the soundtrack with all new and modern technology. I can only imagine what that would be like, but I can imagine it would sound very nice. The failure of the kickstarter to meet it's goals means that Colin did not receive any money to get this game re-released so I can only guess that he funded the game himself. The original game when released perhaps had an easier time at defeating it's competition - it certainly gave the Dizzy games a run for their money and received rave reviews from the press at the time. One thing is for sure, there is a tremendous amount of love to the game. There's not an ounce of bad will in the game or the story. In fact, the only malicious character in the whole game is a witch with a cottage in the forest who has turned Hansel and Gretel into gingerbread people - another thing for Slightly to put right. The fact that the kickstarter failed and yet Colin still proceeded to make the game is a testament to how much love he has for the game. The graphics are a pleasant throwback to a more innocent time but may not win over newer fans who could dismiss them too easily - which would be a shame. Personally I think they look different to anything else on the OUYA which helps it to stand out. The music could probably use some higher fidelity samples but is pleasant enough. It still has that jolly feel to it. A modern Allistair Brimble soundtrack would have been amazing. The controls could use re-mapping. There were many times where I pressed [O] to access my inventory, for something to happen and pressed [O] again to close the message - which did nothing, [A] closes messages. I'd have them both do the same action and have [A] for jumping. The lack of a save option I feel will put people off, even though the game is short by modern standards, the mobile gaming audience often have limited time to spend playing. So a save as you go feature would really help. The game's mood is very nice and the screens for each area demand to be explored. It has more character and charm than a lot of more modern games and was obviously a labour of love. Thank you Colin Jones for this trip to my childhood and for bringing Slightly back for future generations to enjoy.